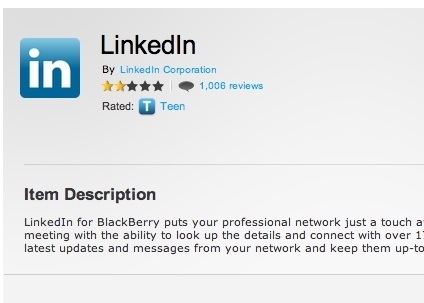 LinkedIn for BlackBerry 2.0 available | BlackBerry Blast! LinkedIn for BlackBerry has been updated to version 2.0 and is now available in the BlackBerry App World. The new version works on all BlackBerrys running OS 6. "LinkedIn for BlackBerry puts your professional network just a touch away. Walk into any interview or client meeting with the ability to look up the details and connect with over 175 million professionals worldwide. Get the latest updates and messages from your network and keep them up-to-date with your status in real-time." Check out the source link below for the download.